Love My Market, Love My Farmers! It’s National Farmers Market Week and I couldn’t appreciate it more, having just attended a workshop on Raleigh’s Hillside Farm. Oh, my goodness, the arduous, hand labor that goes into producing high-quality, organic vegetables. Let’s take a moment right now and send out a #lovemymarket and #lovemyfarmers! The Raleigh’s Hillside Farm event was one in a series of In Her Boots Workshops put on by the Midwest Organic & Sustainable Education Service (MOSES) and was held in conjunction with the inspirational Soil Sisters weekend (all clients for whom I’m honored to design). The focus was on hopeful and beginning farmers, and as you can see by the long line of cars, the interest was huge! 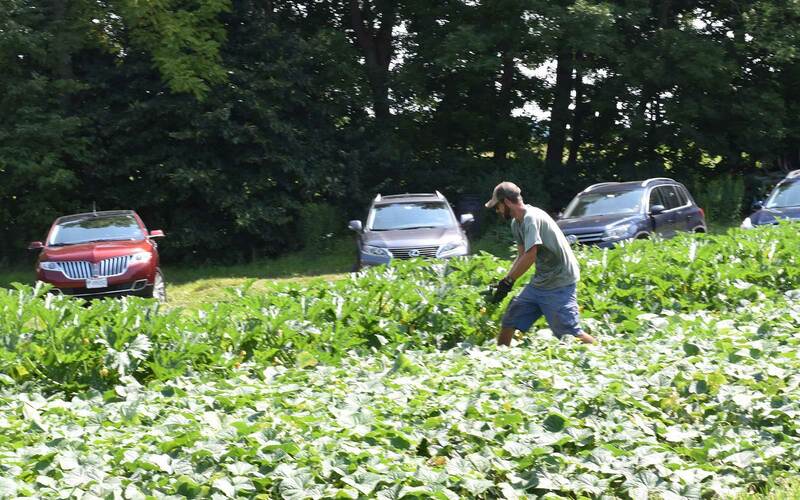 Raleigh’s Hillside Farm, Brodhead, WI, provides high-quality, organic food to CSAs, area restaurants and schools. Lauren Rudersdorf is half the husband-wife team of Raleigh’s Hillside Farm and an enthusiastic Soil Sister (she’s the group’s millennial social media whiz). She presented us with a wonderfully authentic day in the life of an organic vegetable farmer and covered the nitty gritty of starting from scratch. Lauren and her husband, Kyle, began their farm in 2013 on leased family land. She readily admitted they had little experience and even less money. Listening to her now, she’s a wealth of information on farming practices, soil management, produce handling, finances, growth projections and marketing. On top of that, she’s a barefoot bundle of positive energy, which shows in her social media and blog The Leek and The Carrot. With a goal of not going into debt their first five years, the Rudersdorfs kept their investments to a minimum. Here Lauren explains their walk-behind wheel hoe and cultivators. But, hey, farm life is more than romantic Instagram imagery. There are fields to cultivate, weeds to conquer, produce to harvest, wash and chill, and consumers to acquire and deliver to. Lauren and Kyle now run four acres and as I overlooked those beautiful rows my heart palpated thinking of the day in, day out physicality of such a business. Even a farm tour didn’t deter Kyle from a day in the field. Now into their sixth season, Lauren and Kyle have begun investing in their farm. They purchased a Kubota tractor and built a pack shed for washing and storing produce. They also added to their hoop house, which they use for starting seedlings in the spring and extending their growing season. Most people, myself included, don’t realize how much goes work into that gorgeous display of produce at a farmers market. How naive we are. So on this National Farmers Market Week—and every other week for that matter—what can we do to keep these farming super heroes in business? Unless you live under a culinary rock, we all know the physical and psychological benefits of eating quality, organic, local food. So let’s support those who produce it! We know the conventional food-to-store system is broken. 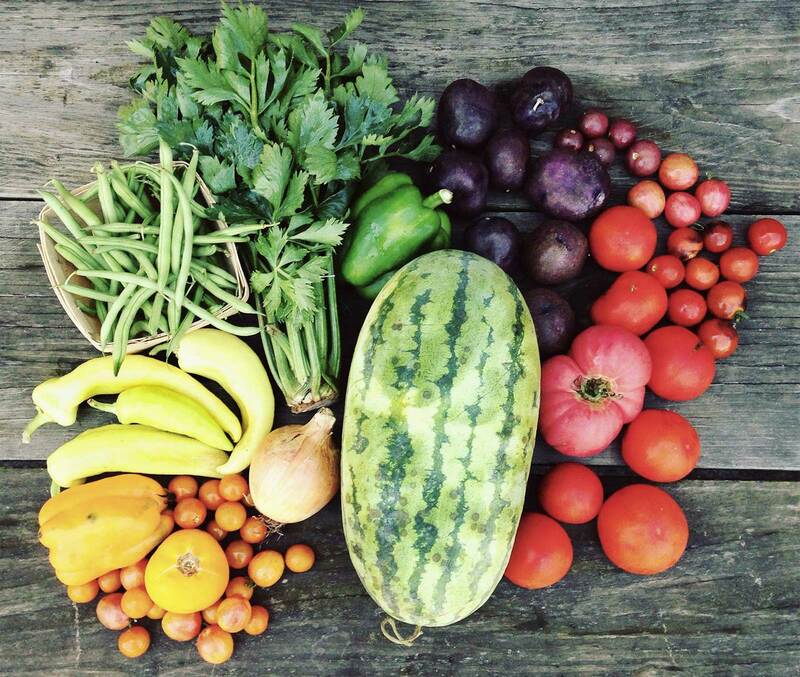 Farmers markets are an alternative and more sustainable way to put food on our tables. So let’s shop there. Here’s a directory of markets near you! We know food brings people together. The same can be said for farmers markets; they bring value to the community and unite its people. So get to know your farmers! Talk with them and learn how they produce their food. Share recipes. Farmers markets are so fun! Happy Farmers Market Week! Get out there and love your farmers!